Forwind kicks off 2018 with the return of the Angry Ambient Artists series. The third volume sees Canadian / European duo African Ghost Valley and Vienna based sound artist and video director Billy Roisz make their series and label debuts. The first time pairing come storming in with a set of tracks that take the series mischievous ambient theme to either its most far-fetched and inappropriate, or most obvious and logical place yet, depending on where your loyalties lie. 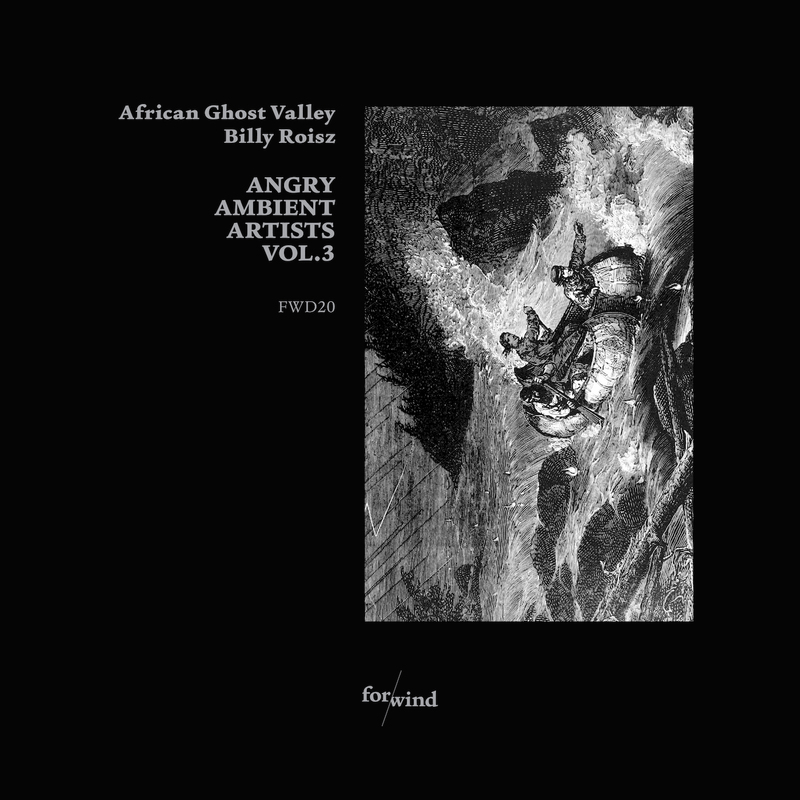 African Ghost Valley have been exploring a vortex like intersection between ambient, industrial, dub and all manner of dark electronics with much success over the last few years (see bio). They continue the trend here with three cuts of blurring cyber ambience and concrète disturbances that gather up elements of drone and noise in their charge forward. 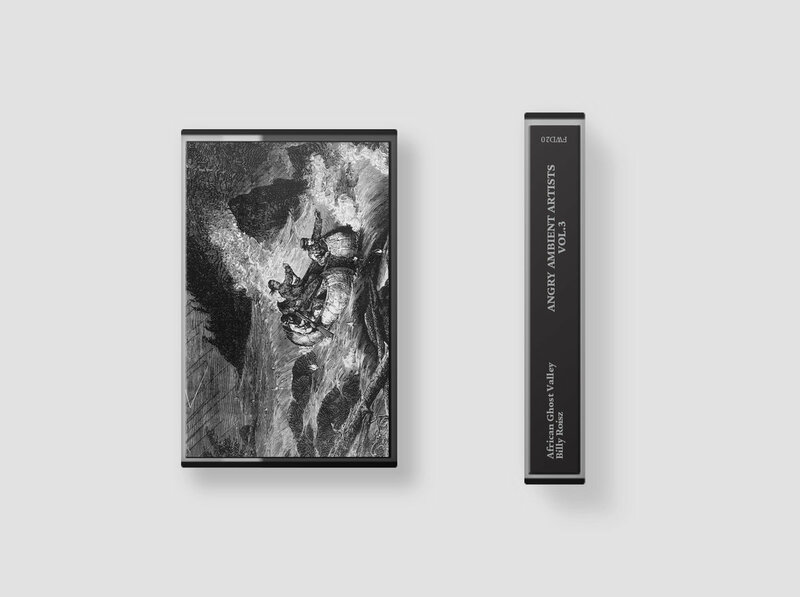 The first piece ‘9732 XE’ opens up with a warped barrage of unrecognisable vocal snippets, screwed up synths and industrial elements that set the tone for their side of the tape. The zipping signs of life that feature prominently in the first piece are taken under and reduced to an atmospheric drone before resurfacing in a different shape and time in the noisy trance, morphing distortion and rumbling low end of ‘MM 152’. The final piece ‘OC 154 T’ is a perfect continuation and development of their ideas as some ecstatic high frequencies do battle with a marauding mid range. It’s almost uplifting in parts even as these snatches of relief get subsumbed in the scraping and screeches as the darkness wins out. It’s wonderfully uneasy listening for people who are happiest facing the dystopia head on. Billy Roisz is as well known for her directorial work as her many sound projects (see bio). It’s hard to not draw from this aspect of her artistic career as ‘Hidden Layers’ presents the listener with a 13 minute kaleidoscopic trip that gleefully changes scene and perspective multiple times throughout its course . The title is more than appropriate for a piece that reveals itself more with each listen. And there are many layers to get through as Billy journeys through the harshest soundscapes while regularly encompassing moments of lightness and melody. There’s an amnesiac effect to the sound as it twists and transforms into something wholly different to where you were only 30 seconds ago. Industrial noise, manic machinery and distorted vocals battle it out with unidentifiable sound grabs, rising bleeps and radio intrusions that leave you feeling like you’ve just entered a demented circus. The listener is quickly dumped from one intense sonic scenerio to another in this shapeshifting track. It’s an uncompromising piece that once again proves what fans of harsher music already know - there’s dark diamonds to be found down these mines.